Due to falling prices,bad climate,crop-loss hundreds of farmers of Mullankolly,on the banks of River Kabani in Wayanad district are cleaning their farms off pepper vines and supporting trees for pepper as they have lost faith in ‘black gold’. In many farm fields farmers are busy uprooting the pepper plants and trees to convert land for short-term crops which are favourable to deccan Climate. 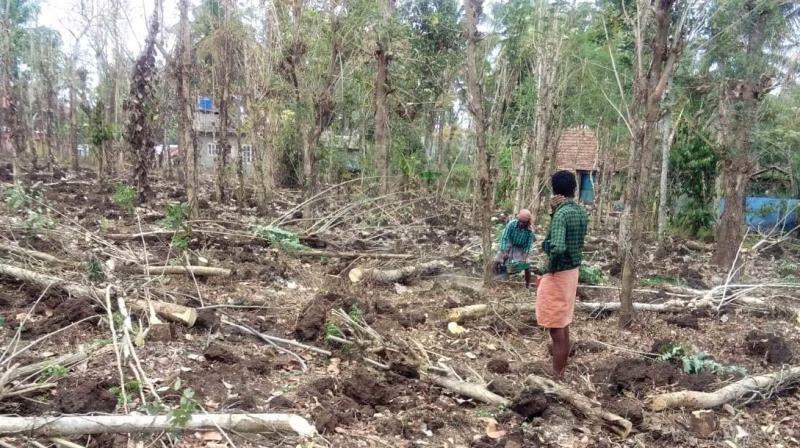 According to Swami KS,farmer who has recently cleaned about one acre land off wilted pepper and also uprooted trees planted as supporting poles for pepper creepers,he has lost faith in pepper farming as he was expecting 500 kilograms of pepper this year but lost it midway in the floods. The plants that survived the floods have wilted down in the scorching heat now. “None of them will help us as we are poor farmers” – Swami told. He has lost faith in pepper cultivation due to bad climatic conditions, falling prices and poor help from officials. Not only Swami, but many farmers are in the process of backing out from pepper and other long-term crops, switching to short-term ones. Swami’s relatives also are in the process of cleaning pepper plants from three acre land. “They were expecting about 2500 kilograms but received almost nothing”, Swami added.